For years, when my Grandma Helen told me about her wedding, I always heard about the story of the carpet rug. Grandma was married in 1944 and at the time, her family lived at 2097 East 2700 South in Salt Lake. In that era, the proper thing for women to do was to have the reception in the home. Her parents lived in a nice two-story home with a grand staircase. Grandma Helen and Grandpa Carlyle at the reception. I can’t tell for sure, but I hope they’re standing on the rug. In that home, there was a very worn, big blue carpet rug. I don’t know how old the rug was or why it was worn or where it was worn. But I do know, that as the story goes, half an hour before the reception, my great-grandpa Cannon (surely only a Cannon would do this!) decided that the worn spot in the rug was not going to be shown at that wedding reception. So he tore up the carpet and turned it over. 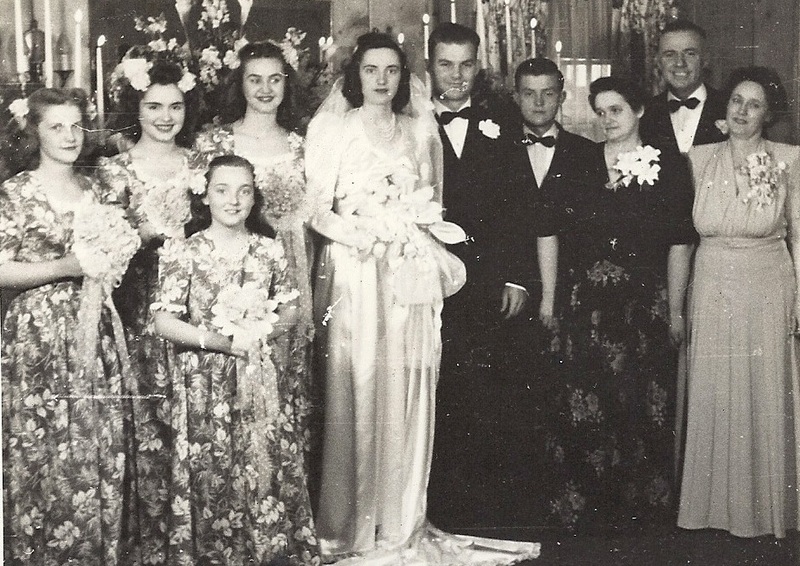 According to Grandma Helen, her mother just about had a nervous breakdown because the reception was just about to begin. Just this evening, I went to visit my great uncle (my grandma’s brother) in the hospital. Uncle Russ asked me where I was living these days. I told him I actually live only a few blocks away from the Cannon home in Millcreek, the home where grandma had her reception. Immediately, Uncle Russ started chuckling and said, “I remember that day. Just before the reception, dad wanted to turn over that old carpet rug and I had to help him. It was so funny!” He described the story almost the same as grandma did, with his perspective of having to help in the carpet turning. I am sure Great-grandma Cannon did not think it was that funny. I bet she really did almost have a nervous breakdown over that (that’s where I get my intensity!) I’m sure she had noticed that worn rug many times, but had the mentality of “Use it up, wear it out, make it do, or do without.” But perhaps at that particular moment, she just wished she had a new rug. But if Great-grandma Cannon had a nice rug at my Grandma Helen’s reception, that sweet family story would have been lost. And that precious connection with my uncle tonight would have never happened, which was something both he and I needed. Sometimes, I think I need to be a little more grateful for the worn carpet rugs in my life.